Côr Meibion Colwyn’s history can be traced back to the late 1890’s when the original choir was formed. 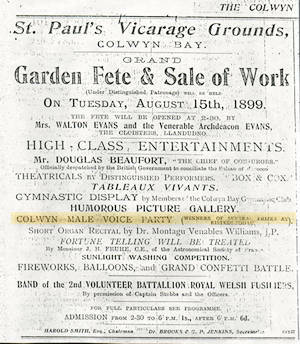 The earliest known reference appears in the Colwyn Bay and Welsh Coast Pioneer newspaper on August 11, 1899 announcing a forthcoming garden fete and sale of works with “high class entertainments” to be held at St. Paul’s vicarage grounds. 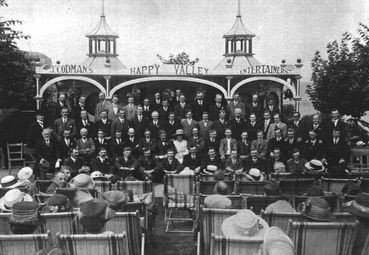 The Colwyn Male Voice Party (the choir’s original name) were among the performers on the entertainment list, and were noted as winners of numerous prizes at local Eisteddfodau. 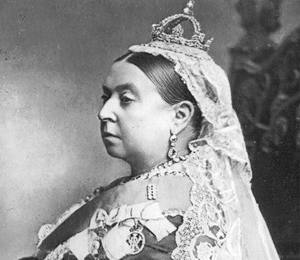 The choir quickly increased its popularity and gained a reputation for the highest quality of musicianship under the direction of Theophilus Jones, and at the turn of the twentieth century, shortly before her death, an invitation was received to sing before Queen Victoria. The choir travelled down to London where they performed for the Queen at the Crystal Palace. Sadly this historic building, where many Great Exhibitions were held, no longer exists following a fire in 1936 which razed it to the ground. The choir grew from strength to strength, and over the next 20 years had competed in and won many competitions including first prize at Abergele Eisteddfod, Llandudno Eisteddfod, and the premiere prize of £25 and a silver cup at Caernarfon. In June 1926 the 70-strong choir entered the competition at Pentrefoelas Eisteddfod and took the first prize of £40. The choir disbanded shortly after and reformed in the 1930’s under the baton of Gwilym Foulks and went on to win the annual Eisteddfod held at the Lewis’s store in Liverpool. 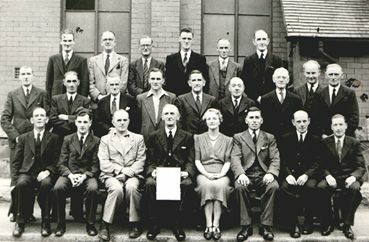 The choir again disbanded, and in the 1940’s ex-choir member Hugh Roberts formed a male voice party which won the under 40 voices at the Colwyn Bay National Eisteddfod in 1947. Harry Kyffin Jones formed a choir called “The Glee Men” in the 1950’s and won numerous trophies, and in the 1960’s Gwilym Davies formed the Aelwyd Choir who competed in many Urdd (i.e. youth) Eisteddfodau, winning first prize in Cardiff. 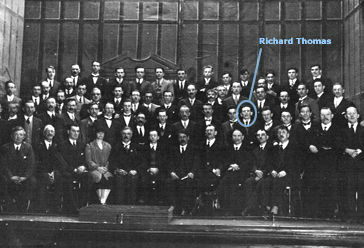 In this photograph taken at the Arcadia Theatre, Llandudno in 1926, the sixth from the right in the second row is Richard Thomas, a well known local tenor soloist at the time. Five of his sons became members of the reformed choir in 1972 and were affectionately known as the “Osmonds”. 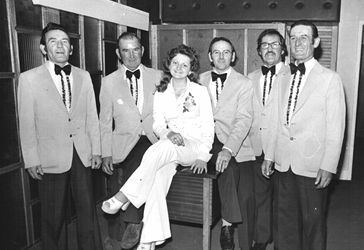 Three of the brothers, Ron, Jack and Dennis Thomas, are still singing with the choir today, and their sister Megan is also chairwoman of the wives and fund-raising supporters committee.